Our private driver “Ourass Travels - private tours in Morocco” will pick up from Menara International Airport in the city of Marrakech, on one of our English language guide, to make the move to RIAD MARANA or MAYMAYA. We travel over High Atlas Mountain and overnight in Riad Maktoub in Ait benhaddou. Today we continue Marrakech bike tour from Ait Benhhadou to visit city of Ourzazatte and Roses valley. We stay overnight in Kasbah Agoulzi. Today we leave Roses valley and we visit Botghrara off road to Gorge Dades. Overnigh in kasbah Tifawen in Dades. 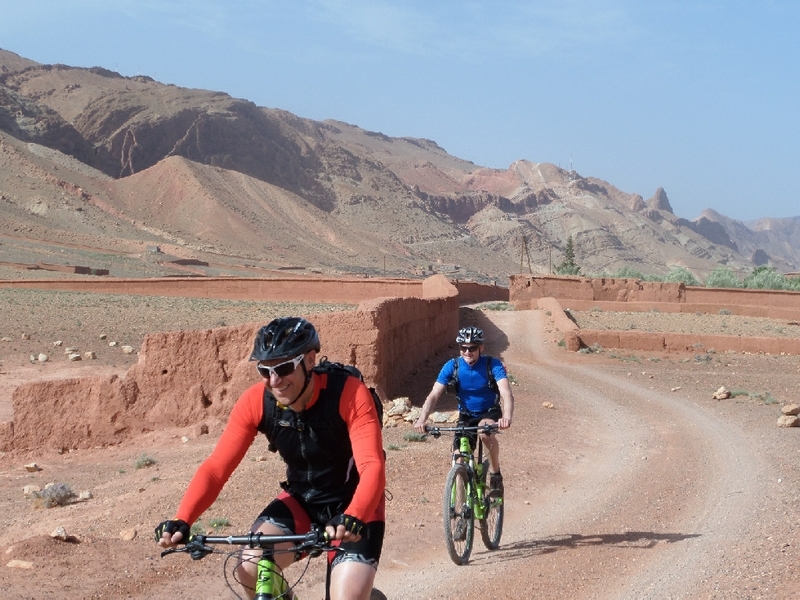 Enjoy private biking tour from Bomalne Dades gorge off road to Tamtatouche then overnight in Riad Aicha in Todra gorges. Explore Morocco in travel from Gorge todra to Merzouga desert including night in the Berber tent wild bivouac in the desert of Erg Znigui. Today we enjoy a day in desert of Merzouga -in a day trip on off road on former “Paris Dakar route” . We stay overnight in wild bivouac in the desert of Erg chebbi. Today we ride from Merzouga desert towards Rissani. Overnight in Alfnif in the tents wild bivouac in the desert mountain. We leave Alnif to Nkob and jabal Saghrou. We stay overnight sleeping in the tents wild bivouac in desert mountain's. We cross the “Mountain of saghrou” via pass Tizi N'tzazart 2350 m altitude with a nice view and beautiful landscape. Then overnight in Boumalne Dades in kasbah Tifawen. We ride towards Ouarzazate city and we stay overnight in local Ourzazatte riad Chamaa. Today we leave Ourzazatte and we head back to Marrakech the end of the bike Morocco trip. Today you will enjoy day trip to Ourika valley with bikes. Then we return back to Marrakech and overnight in Riad Marana with half board. Enjoy free day in Marrakech and overnight in Riad Marana with half board. Today you will fly home (transfer to the airport). Explore best Morocco in 2-week private and desert Marrakech tour. We visit Sahara desert , including Unesco kasbah of Ait Benhaddou , Ouarzazatte and Dades gorges. Morocco guided tour with professional guides , drivers , and transfer in comfortable A/C vehicles - 4x4 or minibuses. Tour available every day during the whole year. If you wish to create own Morocco trip or modify our designed tour, do not hesitate to contact us.